This July you will get to see the scariest magazine cover in the history. BCC Worldwide’s science and technology magazine Focus is using technology to really really scare you! The technology being used is called augmented reality which will literally make your skin crawl! 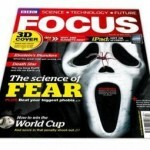 The front cover of the upcoming edition of the magazine shows an image of a mask from the movie Scream. When readers visit the 3D section of the magazine’s website and hold the image on the cover up to their web cameras, a spider will appear to crawl in and out of the mask on the magazine and also runs across the page. And it doesn’t end just there, Focus July issue also wants to use augmented reality to show a video of exploding death star and a 3D model of two nuetron stars colliding. Nice! The technology is great which offers readers a complete new way of reading printed magazines and takes them to a whole new level. “We have already launched augmented reality magazine covers in the US and France and there’s definitely the potential for augmented reality to become a more regular feature of magazine publishing as the technology evolves in the future,” said Myles Peyton who is the sales director at Total Immersion which is responsible for the Focus’s augmented reality cover. It is clear that in the age of the iPad’s and slate’s magazines want to put up a fighting chance. This is not the first time this is being done. In July 2009, Popular Science magazine had its first interactive 3D augmented magazine cover and in September 2009 Entertainment weekly had put in a small video in print into its pages. This sure is exciting news for the newspaper and magazine industry which have taken a hard hit with the new gadgets taking their place in the market. The issue will go on sale on June 3rd in UK and is priced at £3.60. 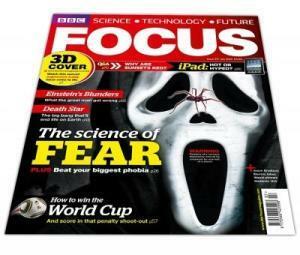 The augmented reality views can be triggered by visiting http://www.bbcfocusmagazine.com/3d and selecting the 3D part of it and holding up your magazine against your webcam. Check this video for a clearer picture.